As decades pass more and more filipino artists are penetrating to International market illustrating most of our favorite comicbook titles such as X-Men, Wolverine, Superman, Battle of the Planets etc. Among the most popular this era is Leinil Francis Yu. Nil (as his friends call him), has been in the industry even before year 2000. He is famous for his works in Superman Birthright, Silent Dragon, and the recently concluded Marvel Secret Invasion. Now it is already a tradition in all media to put Eater eggs on their works. It kinda works as an invisible signature for the authors and artists. Numerous filipino artist had done it in several times. In Nil's work for instance. In Secret Invasion, he incorporated filipino icons such as Francis M. and the President Gloria Arroyo. 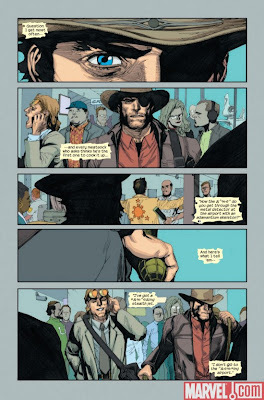 Now in Leinil's current project Ultimate Wolverine Vs. Hulk again he did put another easter egg in the upcoming ending issue. Could be another tribute for Francis M or for the Philippines as a whole. Now we are just hoping that in future, we got the chance to have Active Filipino superheroes working back to back with heroes like Superman, Spiderman and Wolverine. Thanks to Markus for the heads up. It's like finding the hidden mickey!